Zoom and pan through Garrett County to find trails of interest. 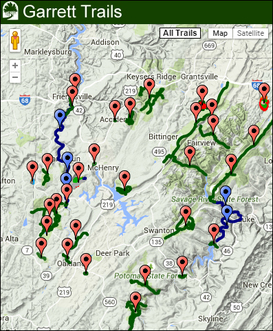 Click icons to get more detailed information and printable local maps of trails. Directions to trailheads are available on each detail page to help you access trailhead parking. 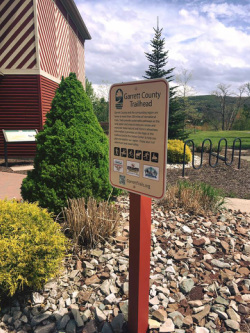 Our County-Wide Trailhead Exhibit at the Deep Creek Lake/Garrett County Visitor Center showcases over 32 trail areas in the county representing over 120 miles of land and water trails. Website visitors can browse through the alphabetically ordered list of trails on this page. Each trail title links to a detailed map and description page with driving directions to trailheads and links to Google Map directions. Trail maps and descriptions provided on the Garrett Trails website are produced with the most current information available at the time of publication. As the sources for this information varies by agency and individual there may be inconsistencies and varying degrees of accuracy beyond the control of Garrett Trails. Additionally, trail conditions and trail routes may change due to land management agency practices, weather damage or other causes. Be aware that on-trail wayfinding markers and blazes are infrequent in our area and cell phone access on many trails is weak or non-existent. Weather in our mountainous region changes rapidly and varies significantly within short distances due to peak and valley topography. Safe trail use and navigation are the personal responsibility of the trail user and Garrett Trails is not responsible for losses resulting from outdated or inaccurate information found on this website. Please report any inconsistencies with trail maps or descriptions to our office at Staff@GarrettTrails.org. Safe Travels!